A 29-year-old Blaine County resident was sentenced Monday to 30 days in jail for felony DUI. Jhon M. Lopez-Macha was also given a five-year suspended prison sentence, fined $1,500 and placed on probation for three years. Fifth District Court Judge Robert J. Elgee suspended Lopez-Macha's driving privileges for one year and ordered that he undergo outpatient treatment for alcohol use as a condition of probation. Elgee ruled that Lopez-Macha be allowed work release during his stint at the Blaine County jail. He was given credit for two days already spent behind bars following his arrest on Aug. 22 by the Blaine County Sheriff's Office. 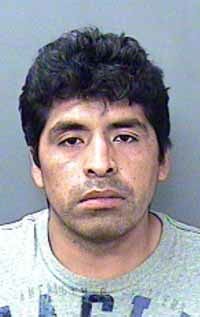 Lopez-Macha pleaded guilty to the charge in October. According to court records, Lopez-Macha, originally from Peru, has legal residency status in the United States. He had misdemeanor DUI convictions in Blaine County in 2005 and 2008. "I know I have made many mistakes," Lopez-Macha said through a Spanish-speaking court interpreter at Monday's sentencing hearing. "I would like the opportunity to become a better person. I told myself I cannot drink anymore." Hailey attorney Christopher Simms, who was appointed public defender, said his client came to Blaine County 10 years ago from Peru and has tried since to improve his life. "Jhon is currently employed at Sun Valley Co.," Simms said. "He is thought very highly of there." Simms said his client does not drink regularly but only on "cultural" occasions and has not had a drink since his arrest in August. Deputy Prosecuting Attorney Matt Fredback acknowledged that Lopez-Macha has no prior felony convictions but argued that he has an alcohol problem. "The major concern that the state has is Mr. Lopez-Macha's failure to recognize that he has a drinking problem," Fredback said. "You don't get to felony DUI in district court without an alcohol problem." Fredback further said that Lopez-Macha has a "significant risk of reoffending." "You can't treat someone who doesn't want to be treated," he said.